Woods also had the advantage of growing up in the economically thriving English north-west where wealthy leaders of the industrial revolution had begun to turn their attention to serious art collecting. It was during these mid-century decades that art museums and schools became part of the cultural landscape in the growing cities of Liverpool, Manchester, Leeds and Birmingham, all of which were within easy access—via the new railways—to a young man studying art. Woods’ earliest training in basic drawing and watercolor occurred at the local public school, but he was soon studying art in earnest at the Warrington School of Art. In 1857, the same year that he visited the old masters exhibition in Manchester, he won his first bronze medal at school. By 1865, at age eighteen, Woods received a travel stipend from the Warrington School of Art to support his studies at the South Kensington Art School in London. Simultaneously, his art school friend, Luke Fildes, (1843–1927) also made the move to London to study at South Kensington. Four years later, both of them were hired as illustrators for a new weekly newspaper, The Graphic, founded by William Luson Thomas, who was an artist and engraver in his own right. The 24-page illustrated weekly was a remarkable success, offering readers both an editorial position based on social reform and a commitment to high quality graphic art. Woods and Fildes soon found themselves in the company of other aspiring and talented artists, including John Everett Millais, Hubert von Herkomer and Frank Holl. With a secure position at The Graphic, Woods turned his attention to building a career as a painter in the mainstream venue of Burlington House, the site of the Royal Academy exhibitions. He began showing his paintings there in 1869 with a canvas entitled Evening in a Welsh Valley, and continued to do so consistently for the rest of his life. From 1873 to 1875, his early genre works in the Burlington House exhibitions were noted, but received virtually no critical attention, perhaps because the young Woods had not quite found his own individual style at that time. During these years, his good friend, Luke Fildes, also became his brother-in-law when he married Fanny Woods in 1874. Woods’ professional life would change dramatically in 1876 when he made his first trip to Venice. There, he was overwhelmed with the city, the light, the water, and the sense of endless possibilities for painting. He painted several canvases featuring Venetian street scenes and sent two of them to the 1877 Royal Academy exhibition. A year later, in 1878, he left London and moved to Venice permanently. He learned to speak Italian, established a studio, and began to develop the style that characterizes his best work. One of his first accomplishments after moving to Venice was finding a comfortable home and studio in the southwestern corner of the city—very near to the Church of San Sebastiano where the renaissance painter Paolo Veronese is buried. Although Woods’ home was a former summerhouse attached to an aging palazzo, he soon renovated it to suit his needs as an artist; the floor between the upper and lower rooms was removed and a glass skylight added across the width of the roof. Later, he would build a glass house on a tiny strip of land in the garden/vineyard area behind the palazzo so that he could have a winter painting studio as well. Once he had settled into daily life in Venice, Woods focused on developing an aesthetic suited to the environment of his adopted city. He was not interested in painting in the vedute tradition of Antonio Canaletto and Francesco Guardi, but rather in capturing the life of ordinary people going about their daily activities. 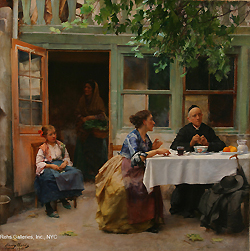 Although Woods occasionally comments on human nature, most of his paintings are depictions of working people from the neighborhoods of Venice. Venetian Canal, (1886) for example, captures life along a small, narrow canal lined with modest houses and working sailboats rather than the romanticized gondolas and palaces of the Grand Canal. In later painting, La Tombola (1904), the subject matter reflects the life of ordinary people, in this case a group of women having fun gambling in a tiny passageway beside the Giudecca canal. Although his permanent residence was in Italy, Woods assiduously maintained his contacts in England as well, sending paintings to the annual Royal Academy exhibitions almost every year between 1873 and 1915. In 1880, the three paintings he sent to the exhibition attracted particular praise: The Ducal Courtyard, Street Trading in Venice, and Preparing for the Festa. The following year, At the Foot of the Rialto, Venice and Gondolier’s Courtship reminded critics and viewers alike how much they had appreciated Woods’ work from the previous year. Finally, in 1882, after submitting Bargaining for an Old Master, Woods’ efforts were rewarded when he became an associate member of the Royal Academy. In 1893, he became a full member. In 1889 Woods also submitted his work to the renowned Exposition Universelle in Paris—and won a bronze medal. One of his most distinguished honors, however, was that he was the only foreign member of the Academy of Fine Arts in Venice [Accademia di belle arti di Venezia]. His work was regularly shown at exhibitions in Venice, and of course, sold privately from his studio as well. The last years of Woods’ life were saddened by the debacle of World War I—and the ambiguous, and ultimately disastrous, position of the Italian government, which could not decide on a clear course of action in relation to either side of the conflict. In the end, the worst Italian battles of the war occurred in the northern part of the country, including the Veneto. Throughout this period, Woods continued to paint until shortly before his death on 27 October 1921. [i] James Greig, "The Art of Henry Woods, R.A." The Art Annual (London: Virtue & Co. 1915), 9.